By a curious twist of fate, the 2014 Cheltenham Festival will celebrate the anniversary of four of the most significant and epic Cheltenham Gold Cups in history: Kauto Star regaining the title in 2009, Best Mate winning his third in 2004, Desert Orchid conquering his Cheltenham hoo-doo in 1989, and Arkle defeating Mill House to win his first Gold Cup in 1964. The last named is perhaps one of the greatest horse races in history, but all four renewals were historically important and greatly popular victories. It is hard to believe that it is already five years since Kauto Star defeated his stablemate, companion, and great rival Denman to become the first horse to regain the Cheltenham Gold Cup. 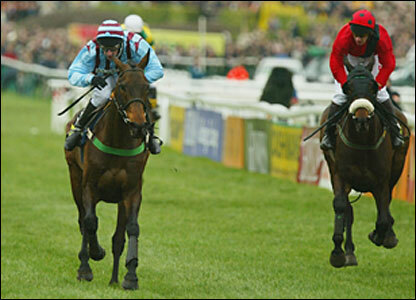 The race was somewhat of a recovery mission for both chasers; Denman was recovering from a heart condition and 11 months off the track, while Kauto was trying to regain the dominating form of the 2006/2007 season and prove that he truly was a Gold Cup champion. He settled both matters in scintillating and dominating fashion, and the game Denman ran a gallant race to finish a respectful 13-lengths behind in second. It was, as Alastair Down observed, the moment that Kauto truly transcended public opinion to become a ‘people’s horse’. He never won at Cheltenham again, but his glorious win will remain the benchmark for Gold Cup victories- rated the finest since Arkle- for many years. It is even more unbelievable to consider that it is already a whole decade since Best Mate defied the weight of forty years to become the first horse since Arkle to win three Cheltenham Gold Cups. The field was far from vintage, and his dogged efforts were a far cry from the ten length romp of 2003, but Best Mate’s third win epitomised everything great about National Hunt racing: a hugely popular horse making history, legendary connections, and a typically emotional and appreciative Cheltenham crowd celebrating the win. It is sad to think that neither Best Mate himself nor the great Terry Biddlecombe are with us any longer, but a small piece of them lives on at the festival that they made their own and, like all Cheltenham legends, they will not be forgotten. Consider then, that it is a full twenty five years- a quarter of a century- since Desert Orchid recorded one of the bravest and most popular wins in the entire storied history of the Cheltenham Gold Cup. Perhaps more so than any horse since Arkle, Dessie was the people’s champion, the courageous and flamboyant front-runner who appealed to veteran punter and casual onlooker alike. His Gold Cup win epitomised all of his talents perfect, won through brilliant jumping, bold tactics, and sheer guts and courage up the hill in terrible conditions. Sir Peter O’Sullevan’s immortal commentary “He’s beginning to get up, Desert Orchid is beginning to get up” is one of the most iconic snapshots from racing. Desert Orchid might be most revered and celebrated for his King George VI Chase wins at Kempton, but perhaps his most defining race was indeed that Gold Cup win at Cheltenham. “Arkle had taken racing by storm before “The Sixties” had reached the mid-point. Before men had walked on the moon or England had won the World Cup, Arkle had captured the sporting public’s imagination. Before Mary Quant had taken hemlines too far above the knee and The Beatles were still planning to conquer America, Arkle had dominated front pages of newspapers as well as back pages. He appeared on the scene just as television sets were becoming “must haves” for every home and he became racing’s first equine star of the TV age. His popularity has endured though. In 2004 a Racing Post readers' poll voted him the most popular horse of all time; and if the poll was repeated today he would win again. It’s hard to argue that any of the good horses in this year’s Gold Cup will ever match the exploits of the four mentioned here, and it is truly special when racing fans are treated to these historical spectacles. Regardless, it’s impossible for anyone to predict exactly how the race will pan out and what its future significance will be; after all, racing excels at defying all expectations.